Low-growing member of the spurge family native to desert and chaparral habitats of southwestern North America, from southern California to Texas. This species is also known under the name of Whitemargin Sandmat. Rattlesnake Weed is a common ground cover plant, usually growing less than 1/2 inches high, with individual plants covering about a square foot, often growing closely and forming mats of vegetation. 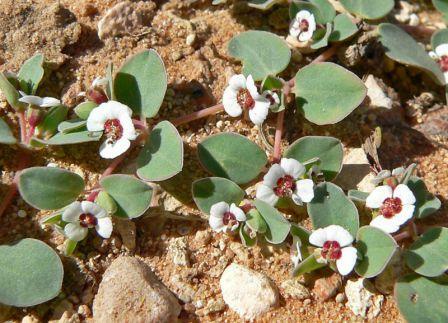 Flowers of this plant are tiny and edged in white, with a purplish center. Rattlesnake Weed can be found in open fields, on roadsides, or anywhere where the ground is disturbed, including ornamental gravels in suburban yards, where it is considered as a weed. The name is derived from its former use as a folk remedy for snakebites (as a poultice or brewed as a tea) - however, this species is not proven to be medically effective in treating rattlesnake venom. Like most spurges, Rattlesnake Weed secretes an acrid, milky sap containing alkaloids poisonous to humans, with emetic and cathartic properties that may be misconstrued as curative.